Thanks to John McGorrigan it appears that I’ve had the dubious, or is that enviable , honour of being the first to be nominated for the LFD “ Ice Bucket Challenge” which entails producing an article on my fishing ‘successes’, plus photographs of my successful flies, so I thought I’d do a piece on early season boat fishing on Ullswater for wild brown trout. The Loch Fishers Bible by Stan Headley. Both these experienced anglers give advice on technique and patterns which have proved very successful. As a rule of thumb—early season trout will be located close in to the shore line …big trout can be found in 6 inches of water ( ok 150mm for the metricated) so both the boat angler and the shoreline angler would be sensible to fish close in. No need for 30 yard (metre) casts over deep water. A floating line can be used but I would certainly go for an intermediate or a very slow sinker for the first 8 weeks or so or until the water warms up a bit and/or the buzzer hatch gets under way. 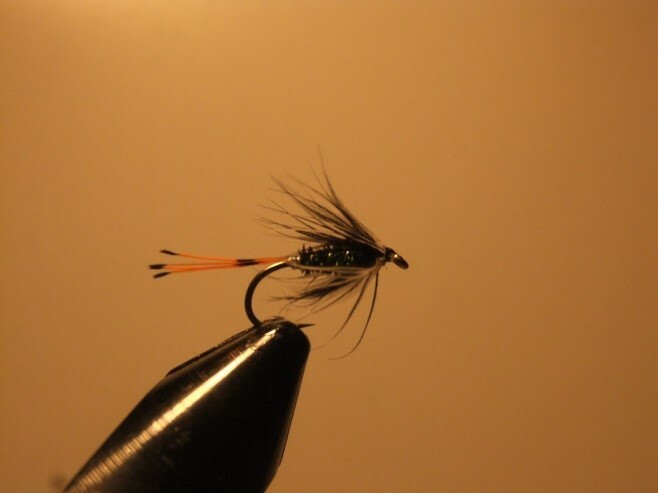 As for the flies—well a general pattern such as a gold ribbed hare’s ear, possibly with a gold, copper or black bead head should get some interest on the point. An emerger midge pattern—such as a Black Spider, Black Pennel, Hutch’s Pennel or Blae and Black has proved OK on the middle dropper. And a pattern which produces some disturbance should be used on the top dropper such as Bibio, Zulu, Claret Bumble . Now all you need are the right weather conditions…..a warm South Westerly breeze, overcast conditions, oh come on …you’ll just have to struggle with what you get…..
Best of Luck and tight lines. 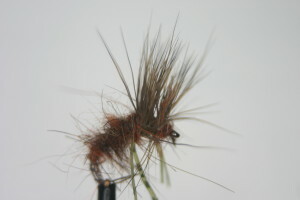 I first came across the Deer Hair Emerger through Bob Wyatt’s wonderful book “what trout want” . He described his flies as ammunition. These were working Flies. 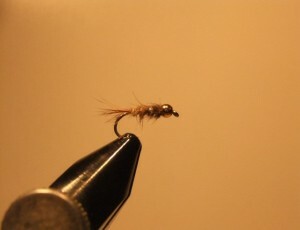 These were flies to catch fish, one after another.These were flies built to last and quick to tie. What was not to like? I tied them up as bob had described and I caught fish. Lots of them. But they didn’t last , not like Bob described them. I wasn’t doing something right. At the BFFI in 2014 I watched Hans Weilenmann demo the split thread technique I decided to use it for my DHE. More to practise the technique more than anything else. Indeed with Hans parting words “practise does not make perfect – perfect practise makes perfect” still ringing in my ears and after watching his DHE 2.0 variant on YouTube, I decided to experiment. The dubbing caught between the thread fibres would add strength. Rubber legs were added as an additional attractor and the hares ear body had added orange hares ear and black seals fur at the thorax. I use other colours as well particularly Olive hues which work well. 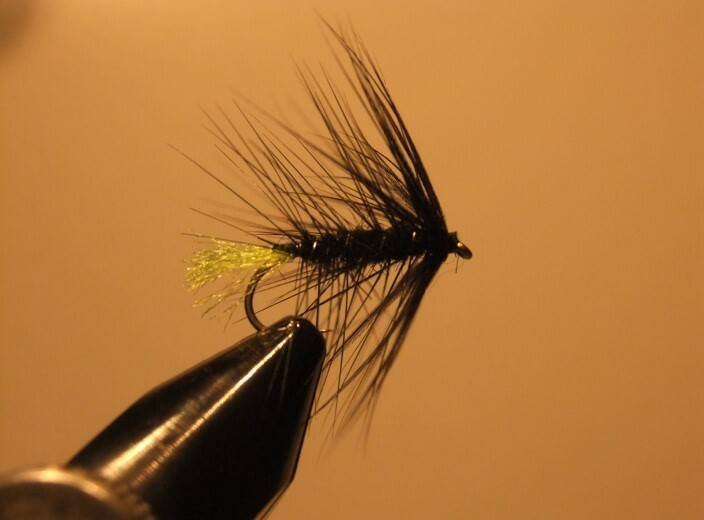 The result is above – My go to fly – It can bring them up, you can use it as an indicator for a nymph hung below, and even with splitting the thread takes only minutes to tie. It wont win the fly dressers competition. 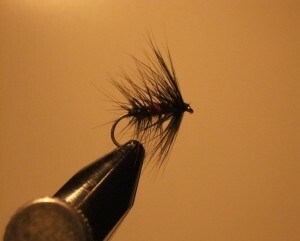 Tie deer hair in forwards, wax thread and wrap around deer hair to trap well and create taper. After creating the body pull hair upright, tie in front, then wind thread through the deer hair to trap again. This makes it virtually bombproof.